If the storm that hit NSW last week proves anything, it is that extreme weather can strike at any time. When it comes to work, being properly prepared to deal with adverse weather can be a difficult. But the truth is that taking a series of simple steps can make a huge difference in increasing workplace safety. Of course, the recent storm is an exception to the seasonal rule, and has been described as the “fiercest storm in a decade”. But while summer produces very hot temperatures, winter weather throws out heavy rains, strong winds and, from time to time, freezing conditions featuring ice, sleet and (in places) a peppering of snow. Ensuring winter safety is a much different prospect. So what can you do in the workplace to make it safer in winter? We have put together a short list of 5 tips to help you improve safety for your workers during winter weather conditions. Most are common sense, but it is worth noting that – as always with safety issues – vigilance is the main contingent, and keeping staff aware of the winter hazards is key. Our shortlist offers an overview of the steps you can take to improve winter safety at work for all of your personnel. But much depends on your particular business type, premises size and staff numbers. Taking a careful look at your own business will allow you to tailor things to suit your own situation. Still, as a starting point we reckon following these simple 5 tips will go a long way. The most obvious winter-weather risk to personnel at work is found in the lobby. 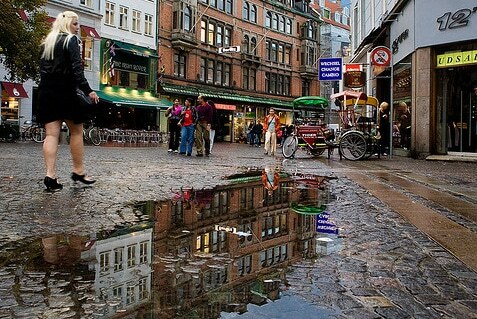 When it rains, people will carry rainwater indoors on their coats, bags, shoes, umbrellas and any other outer surface. That rainwater drips onto the lobby floor, creating patches of water that is hardly visible, and increasing the risk of slipping and falling at work. While the available statistics do not identify the specific location that slips and falls occur, the fact that these types of incidents account for just over 21% of all serious worker compensation claims (2011-2012) and that, according to the Australian Bureau of Statistics (ABS), some 68,200 falls on same level (on a single floor surface) were registered in Australian workplaces in the year ending June 2014, means that having a wet lobby floor should be a significant concern. Of course, the wet floors can occur almost anywhere, including washrooms, kitchens and canteens, but when personnel are heading straight to their workstations or the staff locker room (or customers walking in and out of your business premises), corridors, stairwells and public waiting areas can become risky places too. Lay the floor mats at the entrance that can absorb the wet. Alsco Mats provides a range of floor mats ideal for the job that not only absorbs moisture but are also specifically designed as slip-resistant and wear resistant. Provide an umbrella bin immediately inside the entrance door so wet umbrellas do not drip through the workplace. Segregate wet areas with the relevant ‘wet floor’ warning cones or signs. Regularly mop and dry wet floor areas to ensure safety levels are maintained. In most countries that suffer extreme winter weather, the main threat to worker safety is ice. Even after making the commute to work, a simple slip on ice in the company car park or on the pavement outside the premises entrance can cause considerable pain and injury. In such cases, spreading some sea salt will help to break down the ice and negate the hazard. In Australia, where icy conditions are rare, it might seem that outside the premises there is nothing to worry about, but this is not necessarily true. A severe storm could see debris blown across the car park or pavement – debris that your staff might trip over or slip on as they are entering the workplace. The debris could be anything from litter sent skyward from an overturn bin to branches torn away from trees in the area. Clearing these items away is the only way to remove the threat. Of course, if you’re your business faces onto a public street or the car parking facilities is public, then you are not technically responsible for safety there. But, as a responsible citizen, you should still make the relevant public authority aware of any risks or hazards that might be there – and, you need to remind staff to take extra care. As if we needed any reminding, a severe winter storm can cause a real structural damage to buildings. Whether it is a home or a workplace, the potential damage is the same, ranging from the obvious like broken doors or windows, to the subtle, like leaking roofs or wall cracks. Subtle damage can go unnoticed for weeks, and their consequences can build up gradually before hitting in a major way. Ask staff members to keep their eyes peeled for any damage – whether inside or outside – and to report anything they might see. Remember, it is in everyone’s interests to report any storm damage because it helps to identify risks and keep the workplace safe for all. Also, to maximise awareness, you can put posters up in strategic locations (canteen, lobby, locker rooms, notice board etc.). There are plenty of safety at work signs to download that address this particular problem. Just be sure they are large enough to see clearly, and not a small A4-sized print out hidden behind office plants or an open boardroom door. It would also be a good idea to organise periodic checks on your work premises just in case any potential hazards might be developing. Do so after every storm, regardless of its strength, and include the hidden areas of the building – like the yard, side lanes, and the roof. Depending on the size of your premises, it might take as little as 20 minutes for one person to complete, but in the case of large premises, segment the building and appoint an inspector amongst your staff to carry out the inspection in each segment. If you have a qualified safety officer amongst your staff, he or she should arrange and oversee the premises checks. Maintaining health and safety levels at work means helping your staff to avoid illness just as much as threats to physical safety. We all know how quickly a virus can spread in the workplace, whether it is the ‘flu or some other type of illness, like the norovirus (commonly known as Sydney 2012) which caused severe vomiting and diarrhoea across Australia in 2012, and affected an estimated 1.2 million people in Britain. The risk of a similar outbreak remains high, according to experts, and vigilance is necessary to keep such illnesses at bay. Other communicable diseases that Work Safe Australia has studied and admitted concerns over include Hepatitis A, B and C, Legionnaire’s Disease, and Measles, but the list of illnesses that can easily be spread in the workplace is much longer. So, what can you do at work? Well, the first step is to ensure that the workplace is as hygienically clean as possible and that staff take the necessary precautions to maintain their health. Make sure the restroom is regularly cleaned properly to kill hazardous bacteria. Keep adequate stocks of hygiene products. Maintain staff awareness of office hygiene best practices, like washing their hands, sneezing and coughing into handkerchiefs or tissues. Providing a healthy working environment by regulating temperatures, keeping air circulating, and guarding against cold draughts. For up-to-date information on communicable diseases, the Department of Health has an Australian Influenza Surveillance and Activity Report which is updated regularly during the winter months. Coughing and sneezing is one thing, but it is also essential that medical equipment is on hand in case of emergencies. It is a matter of law that workplaces have sufficient medical resources within the working environment that is easy to find, and that staff members are adequately trained to use the equipment. Key amongst these is the First Aid Kit, and the Defibrillator – both of which can be the difference between life and death in some cases. First Aid Kits – Everyone knows the value of having a first aid kit on site. From disinfecting simple cuts and abrasions to stopping severe bleeding after a more serious accident, these kits are essential when trying to save a life before the ambulance arrives. There is a range of sizes available, as well as mobile kits for workers that spend most of their time on the road or on site. But remember that each kit needs to be fully restocked at regular intervals, so either appoint someone to be in charge of the kits, or opt for a first aid kit rental service that includes regular restocking – such as the one Alsco provides (see below). Defibrillators – It might seem strange, but in fact, studies have shown that people with cardiovascular problems are more likely to have a heart attack in winter due to the colder weather. Australia may not suffer severely cold weather, even in the depths of winter, but any kind of exertion in the workplace in colder than usual temperatures could bring on an attack. Remember, a harsh wind can effectively lower the air temperature (a 30 mile per hour wind can halve the temperature in Fahrenheit). Damp clothes can worsen the situation even more. Of conditions do contrive to bring on a heart attack, then having a defibrillator on site is the best chance of saving a life. Eyewash Station – this is particularly important in workplaces where oils, sprays and other liquids might get into the eye of a worker – places like kitchens, workshop or laboratories. Each eyewash station has an eye wash solution which can be used to wash potentially sight-depriving debris or liquids out of the eye immediately, thereby increasing the chances of a full recovery. Preventing accidents in the workplace is as much about awareness as anything else. The fact is that good summer weather lends to few problems, with the effects of high temperatures perhaps the most obvious aspect requiring attention. But as we mentioned earlier, winter provides a wider range of potential hazards. Introducing a Winter Workplace Safety Program, detailing the specific risks caused by seasonal weather conditions is a good way to raise awareness amongst your teams of personnel. The points mentioned above can be included, but the program should contain helpful information about how to prepare for winter conditions around their specific working facility. Everyone agrees that workplace safety is a serious issue, and that meeting the necessary OHS regulations is important. But maintaining full compliance can be a challenge when that workplace is busy and everyone has a job to do. When it comes to winter workplace safety, with weather conditions increasing the degree of risk to personnel, the importance is heightened. Alsco offers a variety of rental services for all major industry types that mean the hassle of maintaining equipment and replenishing supplies is taken away from your plate. Our dedicated teams look after it all, so you can concentrate on running your business. For more information, click on the links to the services above, or contact Alsco by filling out an online enquiry form or calling us at the branch nearest you.